Stack the States is a quiz game app that tests our capacity to answer questions about capitals, trivial facts, and shapes of our country’s 50 states. The game was developed by Dan Russell-Pinson, costs $0.99, and is compatible with an iPhone, iPod Touch, and iPad. There is also a Lite version offered for free. Not only does Stack the States challenge our knowledge of domestic geography, but it also calls on us to use our Jenga skills in stacking states as well. The game starts with a brief tutorial about the few facets involved. When you start playing, a backdrop consisting of a photograph of one of our many national monuments pops up, then a starting line and a question at the top of the screen, “Which state has the abbreviation AZ?” with a row of 4 options, Utah, Arizona, Maryland, or South Dakota. Each of the options is a square bubble with the states and names inside. The states, by the way, have huge cartoon eyes and a dopy expressions, which led me to the realization that this game was made for kids. Once you choose Arizona (sorry if I gave that one away, I know it was a real mind-teaser), you get to navigate, rotate, and drop the state below onto a platform. You do this in a poised and gentle way so that the state won’t tumble off the platform. The next question happens to be, “Bismarck is the capital of which state?” After you have answered you drop and connect that state (North Dakota) so that it snuggles up with Arizona below. This process gets repeated until you have come up with a high enough stack, you then get the prize of none else but a state and you get to move up to the next level. You get stats at the end of each game that break down the Stack Height, Correct Answers, and Percent Correct, in case you are curious. The incentive for a person to keep playing with this app? Getting all 50 states into your empty outline of our country. 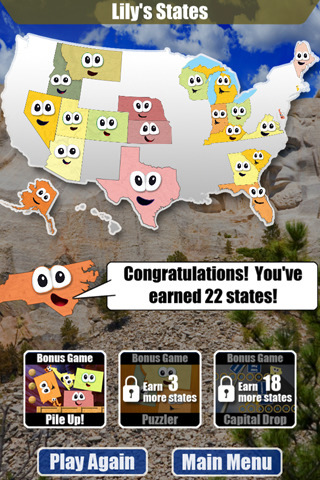 You do this by earning a new state with each level completed. I love geography so any excuse to brush up on it is fun for me. Stack the States forced me to dust off the area in my brain that stored such information as which state is called the treasure state and which states border Canada. 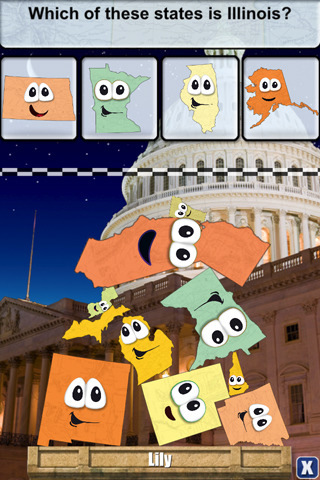 AppSafari review of Stack the States was written by Vanessa Paszterko on October 14th, 2010 and categorized under App Store, Education, Free, Fun, Games, iPad apps, Puzzler, Reference, Universal. Page viewed 6126 times, 1 so far today. Need help on using these apps? Please read the Help Page. We love this app!!!! Wonderful way to teach US states, capitals, etc. I am not sure why this only has three stars out of five because my daughter’s (ages 7 and 9) love it! They are learning so much about our states and having fun while doing it. I told them once they master the game, we will buy them the country one as a reward.